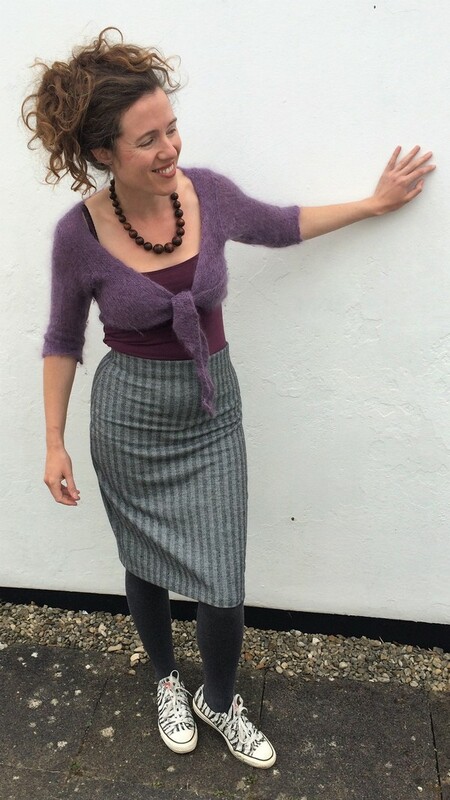 The Easy Knit Pencil Skirt from Gertie Sews Vintage Casual. It’s a simple pencil skirt with an elasticated waist and all the shaping in the side seams. I cut a size 6, grading to an 8 at the waist as my measurements indicated. A poly blend knit I bought in Madrid from Ribes Y Casals (aka the busiest fabric shop I’ve ever visited!). I love the classic tweedy pattern and the fuzzy surface texture–I think this might be what they call a brushed poly, or even a double brushed poly (not sure of the difference). However, it has hardly any stretch. AT ALL. 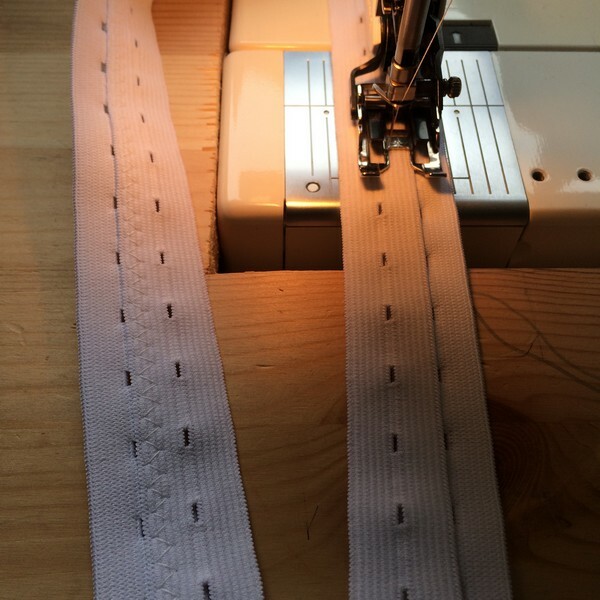 This is the kind of thing I could sew in my sleep: just two side seams to sew, serge the elastic to the top, stitch in the ditch at side seams to secure elastic, then hem. Things were only slightly complicated by my discovery after basting the side seams (so glad I did this, as the instructions handily recommended!) 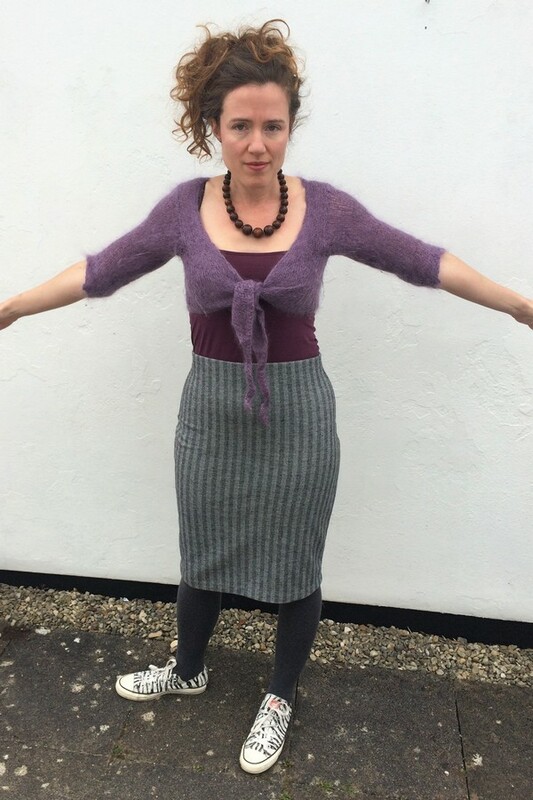 that the knit had so little stretch, I could hardly get it on over my hips. Luckily the pattern has a generous 1.5cm seam allowance, so I was able to use my overlocker to stitch with the minimum seam allowance, giving me an extra 3.6cm ease overall. Just enough to get it on comfortably, although to be honest, still not really enough for this fabric. Should have sized up. I suspect a swayback adjustment is in order, but the rest of the pull lines should be sorted out with a stretchier knit. The other thing I’m not so sure about is the fabric. It’s lighter than I’d really like, and doesn’t really go with most of my tops. The ones I’m wearing in the pics were the best I could find. Okay, I suppose I could wear my white shirt over it, but then you wouldn’t have been able to see the waist as there’s no way that would tuck in neatly. 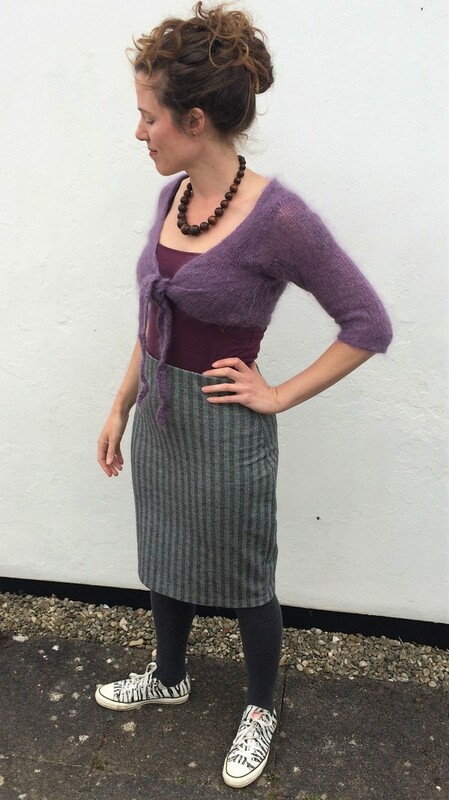 However, this skirt is so comfy and practical I reckon it will get some wear next autumn winter, especially if I lose the couple of extra inches I’m currently holding round my waist and thighs. Better start running and lifting weights again, hadn’t I?! Fabric: £6.20 per metre. Used most of it so I’m counting the full cost. What top do you reckon would go best with this skirt? 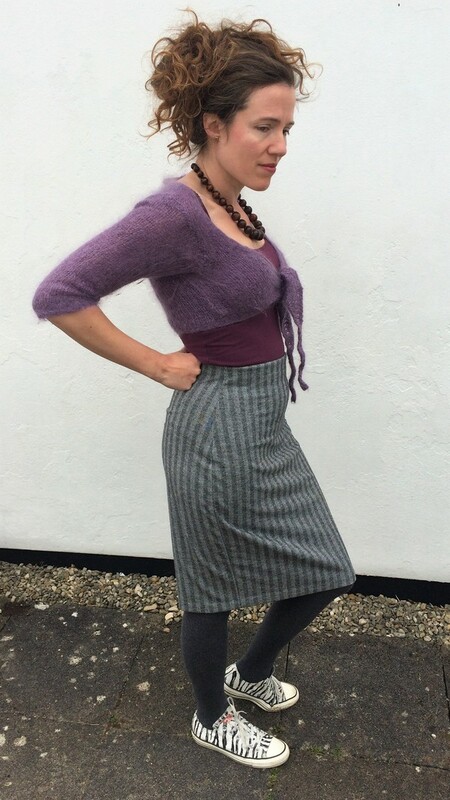 And has anyone else found the perfect knit skirt for them?